A husband from West Sussex who rammed his estranged wife's car has been jailed for two years. 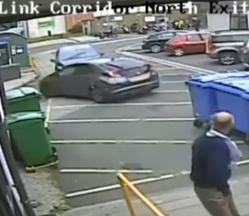 CCTV cameras at the Royal Cornwall Hospital car-park caught Mark Wiggans, 55, driving his car into his wife Tina's car. The court heard Mrs Wiggans had moved to Cornwall from her home in the village of Warbleton near Arundel to escape her husband. Wiggans first attempted to attack his wife by stabbing at her car window with a knife. She drove to the rear of the hospital to flee but he followed and then rammed her car, which also contained one of their children and two friends. Wiggans pleaded guilty to two breaches of a non-molestation order, two counts of criminal damage, affray and dangerous driving. Detective Constable Yvan Clarke, from Devon and Cornwall Police, said: "The conviction of Wiggans is the culmination of an extensive cross-border police operation. "The victim and her children fled West Sussex due to the domestic abuse they suffered at the hands of Wiggans, and came to Cornwall to rebuild their lives away from this man. "He continually ignored non-molestation orders and harassed the victim with impunity. "Wiggans then tracked down his estranged wife to the Royal Cornwall Hospital and attacked her during a terrifying ordeal. Det Con Clarke added: "The victim to this day still fears for her life and those of her children, and this ordeal has left her emotionally drained and constantly on edge. "We hope this sentence will allow her and the kids to no longer live in fear and to start to rebuild their lives."